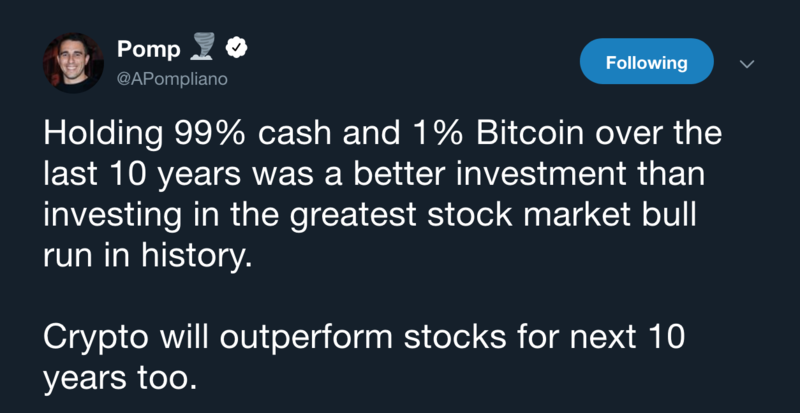 The founder of Morgan Creek Digital Assets, Anthony Pompliano took to Twitter today to state that holding 99% cash and 1% Bitcoin over the last 10 years was a better investment than investing in the greatest stock market bull run in history. According to a tweet by PlanB, a Bitcoin enthusiast, a mere 1% into BTC and 99% cash portfolio beat the S&P 500 over the last 10 years. A decade that is widely considered as the index’s most prominent bull run in history. Even though Bitcoin only beat the S&P 500 by a few % at best, the fact remains that, according to PlanB, BTC has a better risk/return ratio, even though the cryptocurrency has been through drastic bear markets multiple times and is currently stuck in its longest one ever. Anthony 'the Pomp' Pompliano, agreed with PlanB’s observations and even added that crypto will outperform S&P 500 stocks over the next 10 years too. Read more: Will Bitcoin recover in 2019? In December 2018, Chepicap reported that Pompliano had issued 'The Digital Asset' challenge, where they bet $1 million that crypto assets will outperform the S&P 500 over the next 10 years starting January 1, 2019. The Bitcoin maximalist said that whoever takes on the bet will likely be someone who has the same views on crypto as Warren Buffett has. However, he tweeted shortly after to his 186K Twitter followers that no one took him up on the company’s $1 million bet. We issued a $1 million challenge to any professional money manager who thought stocks would outperform crypto over the next decade. No one took us up on the offer. Don’t listen to the naysayers. They don’t even believe what they say.